(Nanowerk News) MIT engineers have designed what may be the Band-Aid of the future: a sticky, stretchy, gel-like material that can incorporate temperature sensors, LED lights, and other electronics, as well as tiny, drug-delivering reservoirs and channels. The “smart wound dressing” releases medicine in response to changes in skin temperature and can be designed to light up if, say, medicine is running low. When the dressing is applied to a highly flexible area, such as the elbow or knee, it stretches with the body, keeping the embedded electronics functional and intact. 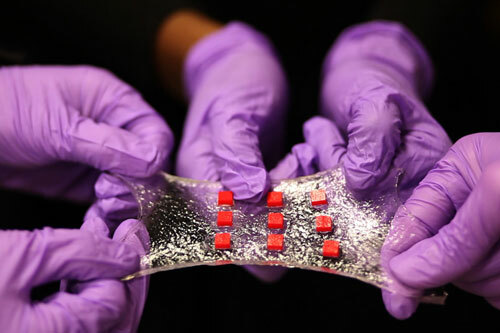 The key to the design is a hydrogel matrix designed by Xuanhe Zhao, the Robert N. Noyce Career Development Associate Professor in MIT’s Department of Mechanical Engineering. The hydrogel, which Zhao detailed earlier this month ("Hydrogel superglue is 90 percent water"), is a rubbery material, mostly composed of water, designed to bond strongly to surfaces such as gold, titanium, aluminum, silicon, glass, and ceramic. In a new paper published in the journal Advanced Materials ("Stretchable Hydrogel Electronics and Devices"), the team reports embedding various electronics within the hydrogel, such as conductive wires, semiconductor chips, LED lights, and temperature sensors. Zhao says electronics coated in hydrogel may be used not just on the surface of the skin but also inside the body, for example as implanted, biocompatible glucose sensors, or even soft, compliant neural probes. Zhao’s co-authors on the paper are graduate students Shaoting Lin, Hyunwoo Yuk, German Alberto Parada, postdoc Teng Zhang, Hyunwoo Koo from Samsung Display, and Cunjiang Yu from the University of Houston. Typical synthetic hydrogels are brittle, barely stretchable, and adhere weakly to other surfaces. To get around these challenges, his team came up with a design strategy for robust hydrogels, mixing water with a small amount of selected biopolymers to create soft, stretchy materials with a stiffness of 10 to 100 kilopascals — about the range of human soft tissues. The researchers also devised a method to strongly bond the hydrogel to various nonporous surfaces. In the new study, the researchers applied their techniques to demonstrate several uses for the hydrogel, including encapsulating a titanium wire to form a transparent, stretchable conductor. In experiments, they stretched the encapsulated wire multiple times and found it maintained constant electrical conductivity. Zhao also created an array of LED lights embedded in a sheet of hydrogel. When attached to different regions of the body, the array continued working, even when stretched across highly deformable areas such as the knee and elbow. 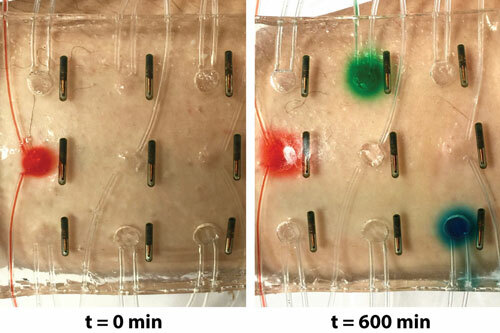 Finally, the group embedded various electronic components within a sheet of hydrogel to create a “smart wound dressing,” comprising regularly spaced temperature sensors and tiny drug reservoirs. The researchers also created pathways for drugs to flow through the hydrogel, by either inserting patterned tubes or drilling tiny holes through the matrix. They placed the dressing over various regions of the body and found that even when highly stretched the dressing continued to monitor skin temperature and release drugs according to the sensor readings. Yuk says an immediate application of the technology may be as a stretchable, on-demand treatment for burns or other skin conditions. Delving deeper, Zhao envisions hydrogel to be an ideal, biocompatible vehicle for delivering electronics inside the body. He is currently exploring hydrogel’s potential as a carrier for glucose sensors as well as neural probes. Conventional glucose sensors, implanted in the body, typically spark a foreign-body response from the immune system, which covers the sensors with dense fibers, requiring the sensors to be replaced often. While various hydrogels have been used to coat glucose sensors and prevent such a reaction, the hydrogels are brittle and can detach easily with motion. Zhao says the hydrogel-sensor system his group is developing would likely be robust and effective over long periods. He says a similar case might be made for neural probes.